Heightsafety Gear specialises in fall arrest, rope access and rope rescue equipment and systems for safe working at heights. The company designs, develops, manufactures, assembles and distributes a full range of equipment for worker safety and performance. Heightsafety’s equipment conforms to the adopted European standards, governed by the South African Bureau of Standards (SABS). The company’s products proudly display the logo as, by being endorsed by SABS, Heightsafety Gear can guarantee the high quality of its products. The quality of the product range is supported by a certified ISO: 9001 quality management system. Heightsafety Line is a range of permanent, engineered solutions for the safe working at height access requirements when using fall arrest and/or rope access techniques. This uniquely patented design incorporates durability and simplicity to ensure an easy-to-use and low-maintenance height safety access solution. For the past 13 years the Heightsafety group has been offering working at heights training through its own Heightsafety Training Academy. 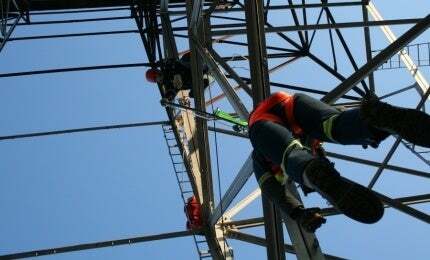 The company conducts hands-on training in fall arrest, rope access and rope rescue. All learning programmes educate workers in the best practice techniques of the industry, so customers can be assured that Heightsafety always covers the fastest, safest way of performing each application. Through its practical training approach on-site, Heightsafety ensures maximum student participation with realistic training that can be applied in the workplace. Successful equipment sales and training programmes with satisfied customers have taken place in countries such as Kenya, Angola, Rwanda, Tanzania, Sudan, Nigeria, Uganda, Botswana, Mozambique and Abu Dhabi. The Heightsafety Group has more than 20 years of experience in the working at height industries. The company’s hands-on approach and applied knowledge has given it the ability to develop quality products that are tailor-made to the needs of any specific task. The quality and standards of Heightsafety Gear’s products are managed by a certified ISO 9001:2008 quality management system. Anyone who controls a place of work is responsible for the health and safety of everyone in that area. Test your skills at the African Rope Access Championships 2014 for the chance to win up to R10,000. Download the flyer here. Download the Heightsafety Gear catalogue for product information and prices of ropes, harnesses, helmets, lanyards, slings, connectors and more. Heightsafetyline ™ is a permanent anchor line that can be used in fall arrest applications. Heightsafetyline consists of individually branded systems: Safe Climb™, Safe Walk™, Safe Roof™.